Standup paddle board (SUP) is taking the paddling world by storm. This fun boarding sports has its roots in Hawaii. In general, paddle boards can be said to be a cross between surfing and canoeing. They are also very useful to get a better view of the water you are surfing on. They can be used on flat water lakes, open waters, on surfing waves, as well as for padding on the easy beaches. 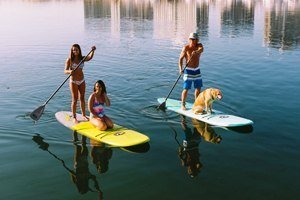 If you are looking to buy one of the best all around paddle board that meets your paddling needs, then the ISLE Cruiser SUP is a very good option. Here is a quick recap on what we think of this SUP. Who Is Isle Cruiser Soft Top SUP Perfect for? 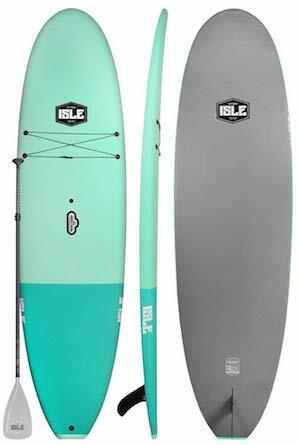 The ISLE Cruiser Top SUP has impressive builds that suit the paddlers of all skill levels. It measures 10 feet 5 inches in length and can carry riders of up to 275 pounds in weight. We would love to recommend this model as one of the best all around paddle board as it offers all round SUP design, soft top deck, high density bottom part, rigid and stable construction, and also suitable for both flat waters and the small waves. The deck of the ISLE Cruiser soft top SUP is made using an EPS core and high-density IXPE/XPE. This core is implanted with three wood stringers to ensure that the board stays afloat on the water. It also helps in keeping the board rigid and firm during paddling. The top of the deck is fitted with polyurethane foam that offers the necessary cushioning to the feet and the legs. This way you can use it for long hours without your legs tiring. The wood stingers make sure that the SUP is strong and durable. With cushioning on the top deck, the Cruiser soft top makes exercising and doing yoga on the board an easy job. ISLE Cruiser is made from EPS, which is a standard when it comes to professional standup boards. This feature makes it a solid and durable SUP that suits both novice paddlers and the professionals. With a solid construction and ease of use, the Cruiser soft top SUP is the best paddle boards for cheap SUP hunters. ISLE Cruiser has a large board area, both in the width and the length department. This offers plenty of room for it to stretch and also be safe on the board. The width helps in easy balancing and this is why it is a recommended product for first-time standup paddle board enthusiasts. It can also be used as a yoga deck in the water as it offers ample surface area. This is why it is also considered to be the best paddle board for beginners. The bottom of the Cruiser soft top SUP is made using polyethylene which is of high-density. This gives it a solid and strong base to withstand the small things that it encounters when moving over the rocks in the water. This is one of the reasons why it is the best all rounder sup board. To get the most out of this soft top SUP, it is better to use it in waters that are free of rocks and debris. Click here if you are looking for other brands. It weighs only 23.5 pounds. Hence, it is very easy to transport and take it to the water or get it off the water. The product has a length of 10 feet 5 inches with 32 inches of width. This makes this model an ideal choice for beginners with enough surface area to stand on. It has a thickness of 5 inches, which makes it a solid performer on the waters. Despite being made of soft foam at the top, the SUP can carry a weight of up to 275 pounds. The grip handle to easily lift and transport the board is ideally placed in the middle of the paddle board. This is an ideal paddle board to use for paddlers of all skill levels. You can get the best out of this model when you use it on the flat waters and small waves. This SUP comes with an accessory bundle offer that includes a center handle, fin, and the adjustable paddle. It can carry up to 275 pounds, which means you along with your dog or kid can paddle on it. As the board is 10 feet 5 inches in size, it offers a wider top that makes it perfect for beginners. It offers great support to the feet and the knees. Ideal for advanced riders who are looking at a standby general-purpose board. The top surface is non-slip. Highly durable and tough board that offers convenient and easy paddling for novice and intermediate paddlers. Quite pricey but you get what you pay for. The ISLE Cruiser SUP is the best river running sup that we found to have a classic design and style. It is a very attractive and beautiful looking SUP that comes at an affordable price. The soft top construction allows anyone to learn the art of paddle boarding easily. It is very dependable and comfortable to use even for the beginners. When compared to the inflatable boards, this model offers better stability and great balance. Generally, soft top stand up paddle board is generally wider than the hardtop ones. The extra width makes it an ideal option for maintaining great balance. 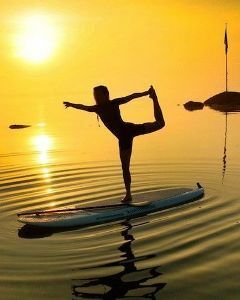 This is why many have been using the ISLE Cruiser SUP practicing yoga postures and doing sun salutations on the calm waters. The ISLE Cruiser has performed very well on most of the water surfaces from the small waters to the moderate surfing waters. This model has also famously known as the best SUP for surfing small waves because it still offers great comfort to your feet and joints even when paddling for long hours. All in all, the ISLE Cruiser is highly durable and offers greater safety than many other paddle board options. It is far better than the fiberglass surfboards which usually cracks, snaps, or chips off easily. There is no doubt that the ISLE Cruiser SUP is one among the top 10 SUP boards on sale in the market for the paddling beginners. If you are not looking to head for the challenging waves or hard surfing and want to learn to paddle in the waters, then ISLE Cruiser is the best option. It is the best SUP to learn the tricks of paddling. As it can accommodate lots of weight, it is a very good option for all the large paddle board riders. You can easily stay afloat on the waters and need not worry about the balancing problems as it has a wider top. As it is a general-purpose paddle board, it suits light waves and flat waters. It is also ideal for lakes and rivers. However, it is not recommended to be used in areas with high and heavy waves. As you can see from this review, the ISLE Cruiser soft top standup paddle board is best suited for first-time paddlers. As it has a wider base and strong three wood stinger constructions, it is highly durable and strong to offer great stability and balance even when doing yoga poses. Other than that, it is lightweight and hence transporting it to and from the beach is not going to be difficult at all. We highly recommend this SUP as it one surely one of the best all around paddle board for all types of paddlers, from being a novice to an experienced paddler. We could not find anything negative to say about this SUP apart from it being priced on the high side but you really get what you pay for. Totally worth the money and we rate it 5/5 stars.